has the numbers 111, 166 and 73. The numbers represent the specific mix of red, green and blue to produce the color. This means that the color consists of 111 points (out of 255) of red, 166 points of green and 73 points of blue. The location of our green color in the color space is indicated by the arrow. Although you can't actually see our green, as it is located inside the space. • Each and every color has its own location within a color space. The location is specified by three separate numbers. Each number represents a height, width or depth in the color space. • Each and every color space has a unique shape. A cook's space is the kitchen. To reach the ingredients for a cake he might have to walk 8 steps ahead, 12 steps to the left and then find it on the 3rd shelf in the cupboard. Every item has its own location, which is determined by the size and shape of the kitchen. Furthermore: the nature of the kitchen will determine which items are available. A kitchen of an Italian restaurant likely contains pasta. While a fast food kitchen probably has a large storage of French fries. 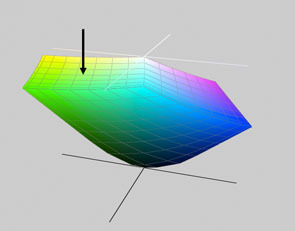 To know the exact location of a color, we need to know the exact shape of the color space. And we need to know how big the steps are that we need to take within that color space. What does '111 points of red' exactly mean? How far do we travel in color space to cover 111 points? And in which direction? Not only a color has its own specifications, the same goes for the color space that contains that color. Let's go back to where we started. The colors on your home computer differ from the colors on your computer at work. That's because every monitor, each device, has a specific color behaviour. Perhaps the green of your monitor is more brilliant than your neighbour's. Perhaps the blue of your computer at work is a bit more violet than the blue of your home computer. If the green on your monitor is more brilliant than the green on your neighbour's computer, it might take only 153 steps of green to produce the color, while your neighbour's would needs 173 steps. This means that your neighbour's color space differs from yours. After all, your neighbour has to take more steps to reach the same item, if the item is available at all. Each and every device has its own color space. This is a comparison of the color spaces of two different monitors. They're not that different because they are the same type of device, but they're different nonetheless. Because the two color spaces differ, the location of the exact same color may differ too. In other words: both devices may need differing RGB values to produce one and the same color. Moreover: some color spaces are larger than others. This means that some color spaces contain more colors than others. A monitor with a large color space will be able to produce more (extreme) colors than one with a smaller space. Thus, a large color space can be a compelling reason to buy an expensive high-end monitor. A color profile effectively describes a specific color space. As a result we can turn every color profile into one of these neat pictures of a 3 dimensional space. If you happen to own a Mac, you'll find an application called Colorsync-utility in your utilities folder which will generate these graphs. If you're on a Windows computer, you can download a utility from Microsoft which will do the same. How about if we would specify a color space which is not associated with a specific device? Is it possible and what would we have to gain? It is possible to create such a color space. There are in fact many color spaces that are not connected to any specific device. Some of these are widely used and their names like 'sRGB', 'AdobeRGB' and 'EuroscaleCMYK' might ring a bell. The CMYK color space is a bit of a peculiar animal in that it has four dimensions instead of three. CMYK is used in the print industry because all printers are CMYK by default. Home and office printers work in CMYK as well, but are generally fed with RGB and perform their own conversion. So in 99 out of 100 cases there's no need to occupy yourself with CMYK, unless you're a print professional. There are some advantages in using a device independent color space. To begin with, you don't need to know which device was used to produce the colors. As long as you have a color profile -any profile- accompanying your RGB value, it will point to a specific CIELAB color. Furthermore, the device independent color space may save you a few rounds of converting. The conversion itself is generally done in the background without bothering anyone. But the problem is that each conversion degrades the colors. See the next chapter for the reasons why. Moreover, some color spaces have been designed specifically to contain colors that not many devices can reproduce. Suppose you take a picture of a beautiful vase which has a teal color that your monitor is unable to reproduce. Even so, if the picture is saved in a larger device independent color space, your printer may still be able to print the teal color. In the next chapter we will look deeper into the issues concerning the conversion of colors.